Last week we made a trip back to Salon Vim to try the newly created Arimino Privy Treatment. because my hair was becoming pretty dry after not taking care of it while I was in Korea. I was told it contained coconut oil so I thought it might stink a little but I was wrong. It smelt damn good throughout the 45mins process! I'm so impressed by this new treatment of Salon Vim! I must say the result is amazing! Because I had my hair bleached right before the treatment. My stylist Fiona already warned me about how dry my hair will be after bleaching as I refused to have the split ends snipped. Thanks to Armino Privy Treatment, my hair felt much softer and healthier! Of course you need to take care of it by doing mask and applying serums when you're home! Simply quote my name 'Jolene' to enjoy the discount! Remember to look for her if you're planning to get your hair fixed at 313! With the sister who is still in awe of how silky her hair became after the treatment! Super happy with how well my Pink x Purple hair turned out ! My outfit of the night, in an upcoming Racer Cut-in Lace Top from Ohvola! I try to mask my hair every 2 days with the Vitamino Colour to protect my pink x purple hair from decolouring and also to keep it moisturized. And on days when I don't, Redken's Extreme anti-snap leave on treatment to the rescue. 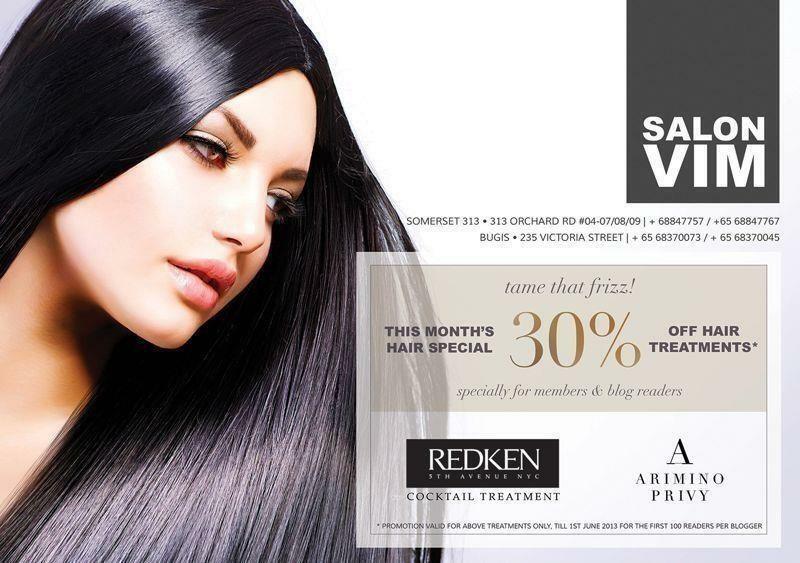 It's time to pamper your hair with the 30% discount for the month of May! Guess we just have to skip supper & exercise more! XD Nice seeing you too! Hi Jolene, may i know how much is the hair treatment roughly before discount?